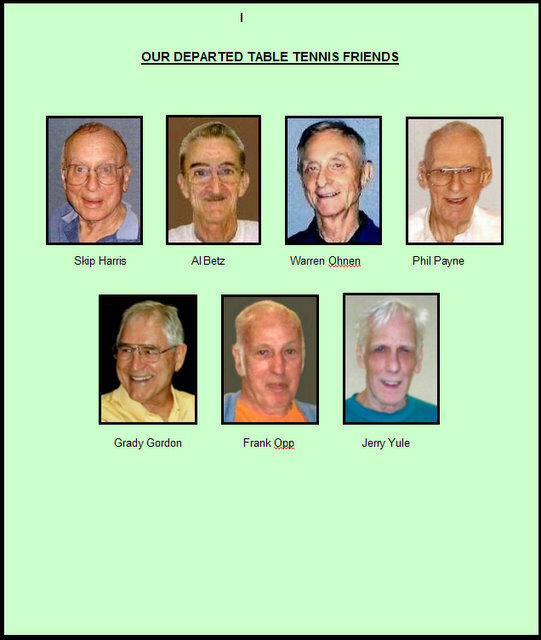 Dorothea Taschner, a longtime DFWTT tournament player, passed away on August 20, 2012. 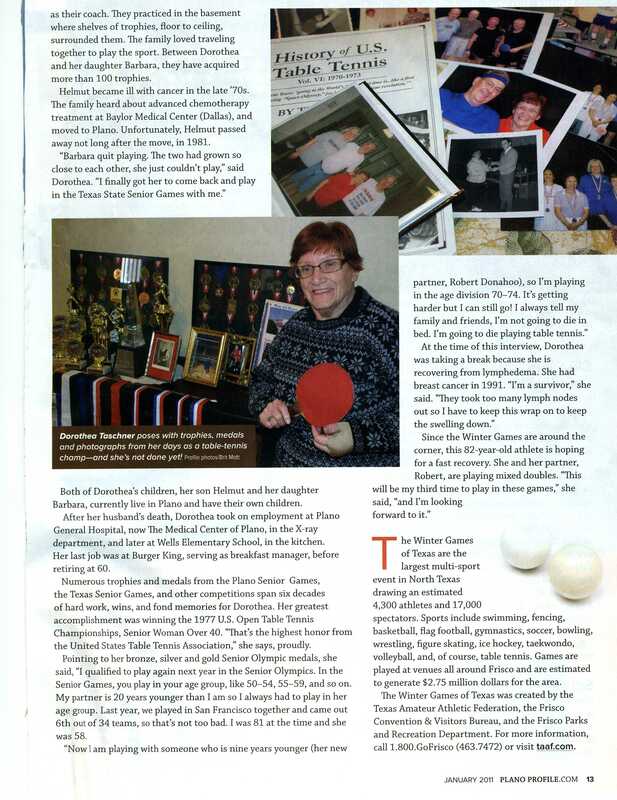 Her table tennis playing spanned many decades after she first started playing at the age of 16. 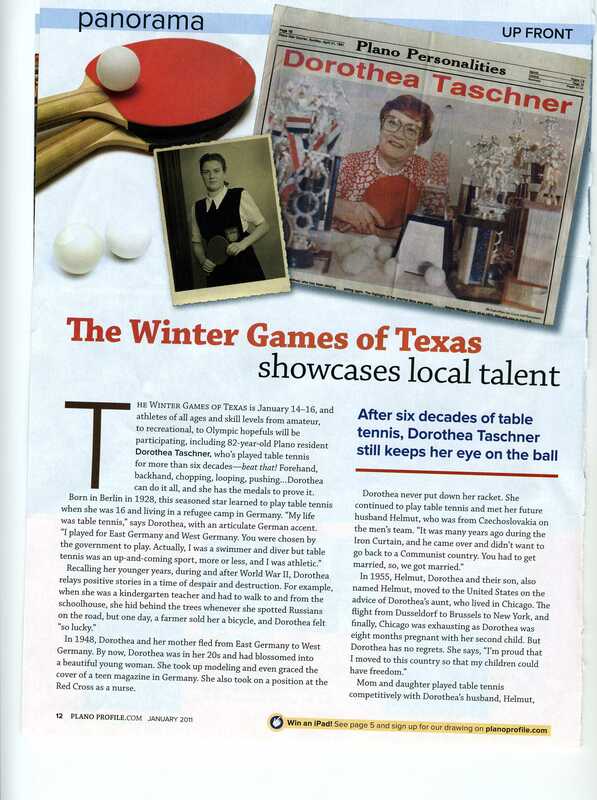 In the January 2011 edition of Plano Profile, a very interesting article was written about her life and her passion for table tennis. In loving memory and dedication of Hollis. 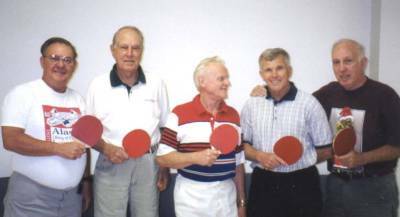 Hollis Hall was an avid table tennis player, who had a passion for table tennis. He was always a pleasure to be around, and it did not matter if he won or loss as long as he was playing table tennis. Hollis played many tournaments with Vic Maryoung as his doubles partner. Even during his battle with cancer he thought about making a come back to play. Unfortunately, Hollis passed away July 8th 2003 after battling cancer. 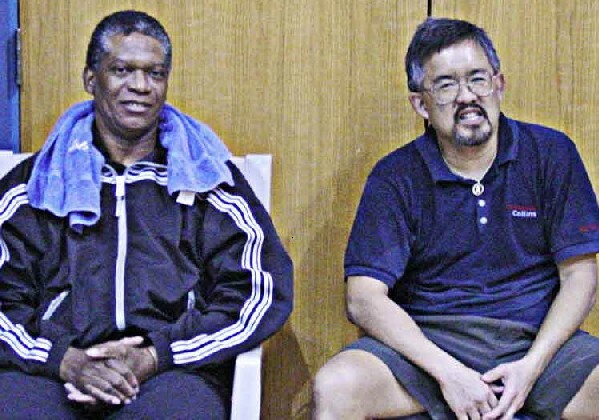 His legacy and passion for table tennis lives on in all of us. My friendship with Frank was that we had so much in common in our younger days, both educated as Engineers, both worked as Engineers for technical companies (Collins Radio for me and T.I for Frank) and both were in the Marine Corps. I think our Engineering connection was the strongest since you can take the slide rule away from the Engineer, but you can't take the Engineer away from the slide rule, meaning that we both had an analytical mind and "thought" like Engineers our entire lives. Frank applied his engineering background to his game of table tennis and analyzed his game from an engineering standpoint to an almost obsessive degree to improve his game but he mainly achieved a degree of success by perseverance rather than trying to understand the angular momentum of the ball when struck with a particular angle and speed of the racquet. He improved his game by hitting hundreds of balls a day and hundreds of serves a day and just about wore out a robot machine which he modified to feed him table tennis balls at obscene speeds and spins. He also took lessons off and on for years from instructors who helped him develop the techniques for success. 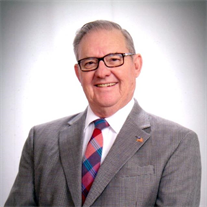 He played four or five times a week at the recreation and senior centers in the area and also in about every tournament from the Red River to the Rio Grande. In short, he was a Table Tennis fanatic. However, when away from table tennis, I saw another side of Frank when our interest in birds and Purple Martins in particular provided many long discussions on their antics and how to attract them and keep the House Sparrows away from their nests so they could raise their young in safety. Frank was an interesting person and a good friend and I have missed him very much. Frank Opp loved table tennis. That became obvious as soon as he started to play. As engineering had been his vocation, table tennis became his avocation. His retirement years were spent practicing, learning, playing and traveling to various tournaments. It was a new life. Enthusiastic. Determined. Competitive. Dedicated. Sincere. Obsessed. Frank Opp!